4 How to test it? 4.3 What you should see? 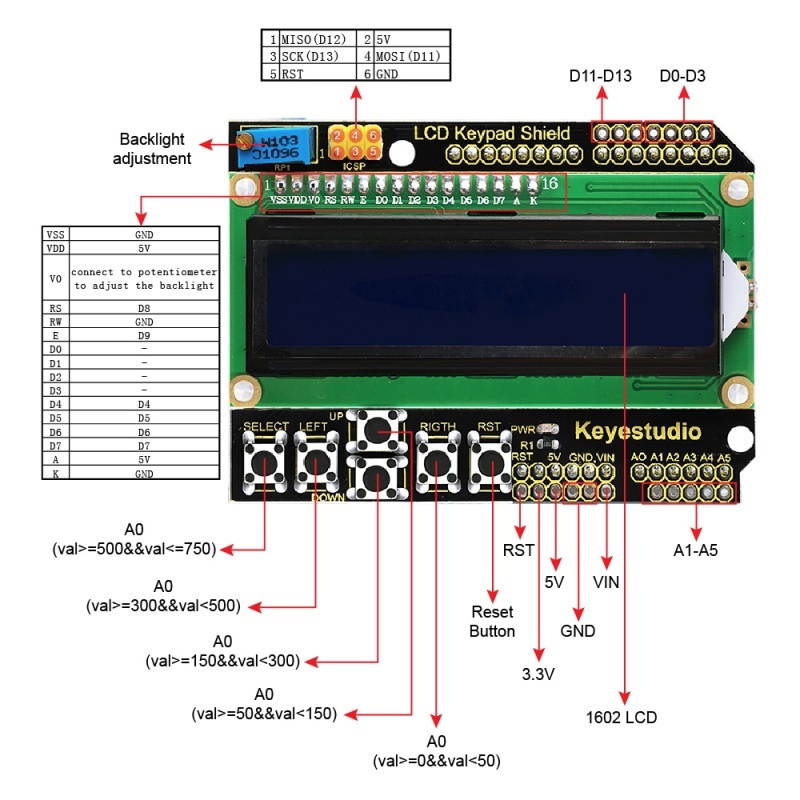 The keyestudio LCD shield integrates 1602 LCD display and six buttons into one piece, which is fully compatible with keyestudio UNO R3 control board. It is very simple and convenient for you to stack it onto UNO board . There are two communication methods for 1602 LCD display and UNO R3 board, separately the 8-Bit connection and 4-Bit connection. 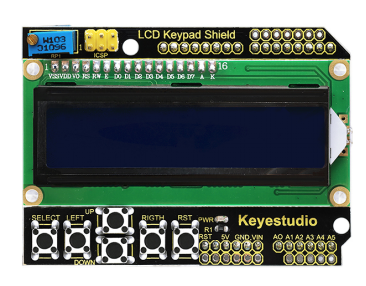 The LCD shield is default the 4-Bit connection. Under LCD there are 5 control buttons (Select, Up, Down, Left, Right) and a reset button. The 5 buttons are connected with A0 analog input only, so you can monitor button status using just one Arduino input. Pay attention: status monitoring is unavailable when several buttons are pressed. The shield also comes with a potentiometer to adjust the LCD backlight. 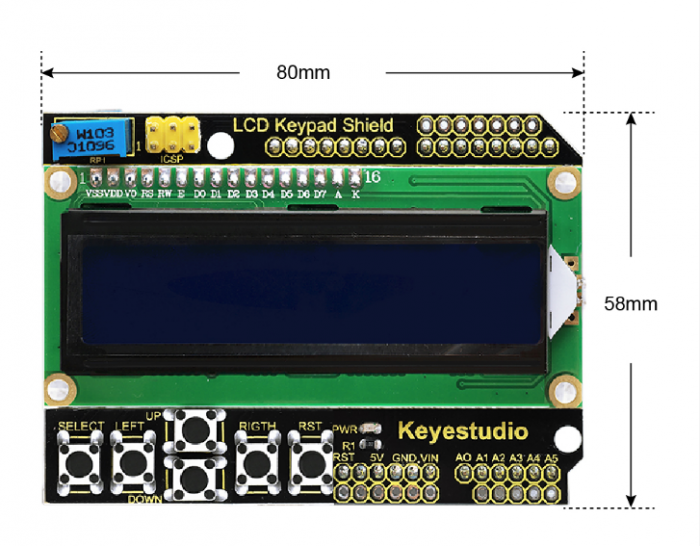 Simply stack the LCD shield onto UNO board, then connect the board to your computer with a USB cable. 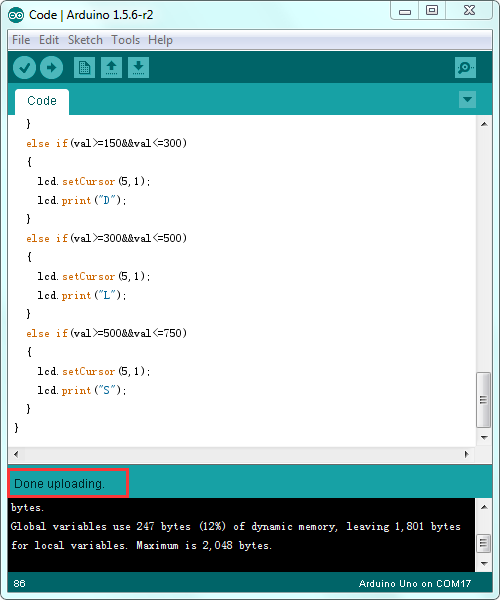 Note: Before compile the code, do remember to add the necessary libraries inside the libraries folder of Arduino IDE. 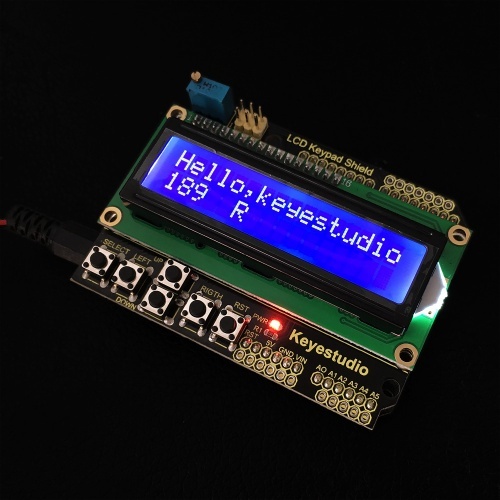 Done uploading the code to the board, you should see the LCD screen show “Hello keyestudio” on the first line, and the second line shows the increasing number. If cannot see the text clearly, rotate the potentiometer on the shield to adjust the screen backlight. You could press the five buttons to separately get the letter S U D L R, and press the Reset button to restart it again.